Oak Ridge is a city in Anderson and Roane counties in the eastern part of the U.S. state of Tennessee, about 25 miles west of Knoxville. 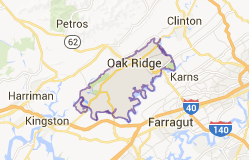 Oak Ridge's population was 29,330 at the 2010 census. It is part of the Knoxville Metropolitan Area.